There are many low-lying coastal airports around the world. These airports are increasingly vulnerable to the rising sea levels and the more extreme weather brought about by climate change. According to two recent analyses, 25% of the world’s 100 busiest airports are less than 32 feet above sea level. Twelve of these – including airports in New York, San Francisco, Rome, and Shanghai – are less than 16 feet above sea level. Low-lying regions near water have always been viewed as ideal sites for runways, since there are fewer obstacles and neighbors. But the coast doesn’t provide much in terms of natural protections from flooding or high winds. Most airports were not designed with the effects of climate change in mind. 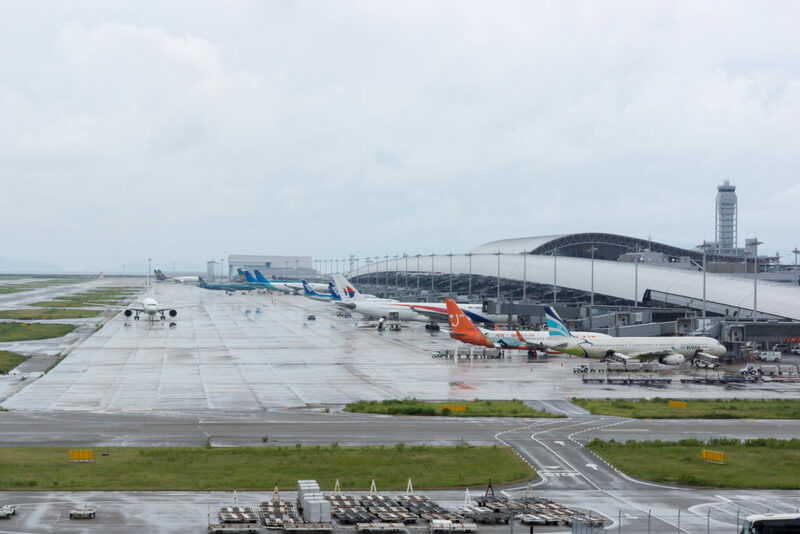 Travelers at Kansai International airport in Japan recently experienced firsthand what can happen at low-lying coastal airports. Following a powerful typhoon that tore through the region, thousands of stranded passengers looked out to see only the ocean where they should have seen the runway. Another recent example is Hurricane Sandy in 2012, which inundated all three airports that serve New York City. The aviation industry is also grappling with other effects of climate change. Hotter, thinner air makes it more difficult for planes to take off, and climate change can also increase turbulence. The airline industry is not just a victim. Air travel currently accounts for approximately 3% of global greenhouse gas emissions, and is one of the fastest growing sources of emissions. According to the International Civil Aviation Organization, emissions from international air travel are expected to triple by 2050. The future is shaping up to be a bumpy ride. Photo, posted August 30, 2015, courtesy of Flickr. ‘Airports and Rising Seas’ from Earth Wise is a production of WAMC Northeast Public Radio.